Compliance software developer Strevus has added support for bitcoin and other digital currencies to its existing compliance software service. The company says it will offer institutional-level compliance and support to bitcoin as well as other digital currencies. Strevus appears to be aiming to carve out a niche for itself by offering cutting edge know your customer (KYC) and anti-money laundering (AML) features for bitcoin platforms. The company argues that regulators are likely to adopt regulatory mandates similar to those already in place in traditional banking and trading networks. Strevus says its software will offer enterprise-quality regulatory coverage, scalability and security to organisations who intend to trade in bitcoin. The software allows bitcoin operators to fully comply with existing KYC, AML and Patriot Act requirements, but it can also be updated to meet additional requirements, namely tax compliance. The company says its software can easily integrate to existing exchanges and institutions. Strevus believes regulators are likely to enforce new tax rules as well as KYC and AML requirements for bitcoin companies. Therefore, it emphasises the fact that its solutions can be used on existing bitcoin platforms. “With experts predicting that cryptocurrency will complement fiat currencies rather than replace them, we believe that they will become a viable and efficient value-transfer option. As a managed solution, Strevus provides exchanges and institutions with a persistent, secure and auditable compliance service to manage and track these assets. 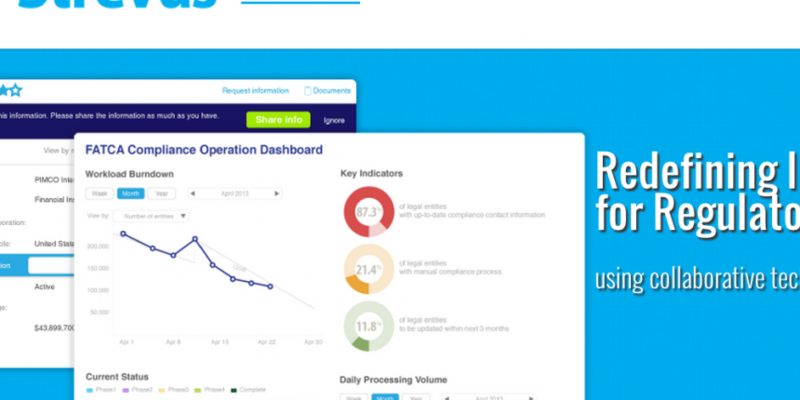 Founded in 2012, Strevus has raised $5.6m for its risk and compliance software. The startup is hoping to make a name for itself on the back of new compliance requirements for the banking sector. Adding bitcoin support to its software is just the icing on the cake, as a subscription to Strevus’ banking compliance service starts at $100,000. As more institutional investors take an interest in bitcoin, the need for compliance software and industrial-strength security will become more evident. Last month, Perseus Telecom launched a new service designed specifically for digital currency operators. The company provides high-bandwidth communications used by trading firms and hedge funds in several major financial hubs. Perseus CEO Jock Percy says the ultimate goal is to facilitate bitcoin trading by large financial institutions and engage “known players” in bitcoin. He said some clients expressed demand for bitcoin services, but they also expressed concerns about regulatory compliance. This appears to be the niche Strevus is hoping to achieve.